Last month I had the wonderful opportunity of spending a few days with 4 sweet little girls aged between 7 months to 5 years - one is my friend's daughter and the other 3 are my nieces. I fell in love with their heart-warming smiles, their wonderful stories, their gentle play, innocent eyes and pink blushing cheeks. Though I love my son's curious mind, wild imagination and spontaneous actions, I thoroughly enjoyed the calm and serene world of little girls. These 4 little girls are the inspiration for these cute little cupcakes. I'd like to call them Blushing Beauty Cupcakes. Apart from the fact that the batter for this cake can be easily whipped up in a blender (! ), let me also tell you that there is a surprise ingredient in these. 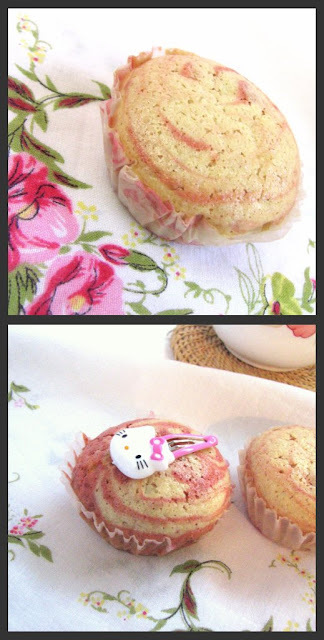 Can you guess what is the gorgeous pink colour on the top of these cupcakes? I prefer not to use food colour in home-cooking, simply because we get enough and more of artificial stuff from the outside food. So for the wonderful pink colour, I used beetroot!!! And the final product tastes just like good home-made vanilla flavoured cake! There is no tell-tale beetroot-y smell and no bits of grated beetroot as it is lightly cooked and blended into the batter. There is just beautiful pink colour on top of the cake. I was glad to see my son eating the cake happily oblivious to the fact that it had some veggies inside :) The people who gobbled up the cake were indeed surprised to know that I added beetroot to it. Cook the grated beetroot in its own juices over a medium-low flame for 2-3 minutes. Do not pour any water into it. Pop in all the ingredients (except the cooked beetroot) into the blender. Yes, you read right, a blender will do for this cake. Though if you like, you can always go on and be a purist and do all the usual steps for making cakes. But for this cake, all that is really not compulsory. Blend till uniformly combined. If you feel the batter is too thick, add a couple more Tbsp of milk. Keep aside half the mixed batter + 2 and 1/2 Tbsp of it to another bowl. To the remaining half of the batter minus the 2 and 1/2 Tbsps, add the cooked beetroot. And blend it for a minute. Bake it in the preheated oven for 25-30 minutes or till a toothpick inserted comes out clean. These cupcakes are perfect for the friendship day virtual party hosted by Renita and Roshni.